New Additions To The Exclusively Ours Collection! create a stunning display and will hold a delicious treats or trinket for your guests. Featured here in a stunning color combination perfect for an elegant shower or wedding! If you are searching for a truly unique favor, our hand crafted boxes are the perfect fit. This favor is custom created with an aqua blue high quality two piece glossy box. Each box is wrapped with a grosgrain ribbon in a stunning striped color combination white, celery green, lime green, soft orange and a touch of red. The lid is then accented with a three loop flat bow in the same ribbon with three layers of hydrangea petals in white and celery green layered upon it. A hand set pearl center is the perfect accents! Available in your choice of high gloss aqua (shown) or high gloss white box or mix and match the lids and bottoms. For matte colors you may also select orange. Each box arrives fully assembled - just fill with treats of your choice! Try Hershey Kisses (each box holds up to 15), hard candies, coordinating colored jelly beans, jordan almonds or a potpourri sachet! Each favor box measures 2" x 2" x 2"
Please note embellishments and trims may vary slightly due to availability. our Hand Crafted Calla Lily Favor Box is the perfect fit! No two favors are exactly the same as we hand craft each embellishment and box to order making each one a little work of art. The red calla lily is the magnificent focal point of this piece as it lays upon a spray of white tulle, a green leaf and is accented with a hand wrapped yellow satin ribbon. A band of grosgrain ribbon in stripes of oranges, yellows, reds and greens ties all of these magnificently vibrant colors together. Elegant to display at your celebration and for guests to use for trinkets after the party has ended. 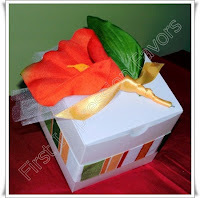 Each favor box arrives fully assembled - just fill with candies, cookies, fudge or small gifts of your choice! Boxes measure a generous 3" x 3"x 3" square. Also available in 4"x4"x4" square. Select from an assortment of box colors to coordinate with your decor! Also available with a light yellow calla lily. You may also mix and match red and light yellow calla lilies for a wonderful presentation. Please note boxes and embellishments may vary due to availability. Custom made for a Bat Miztvah, this stunning paint can favor is featured here in the quart size and is hand decorated with a royal blue and silver striped ribbon upon a white background. A elegant personalized label and a six loop hand crafted white organza bow with a double row of rhinestones in the center are the perfect finishing touch! As each can is custom made to order, select your size can, your choice of color background, choice of ribbon trims, choice of font and choice of optional bow to create a most unique favor for a bar/bat mitzvah, Sweet Sixteen or elegant wedding. 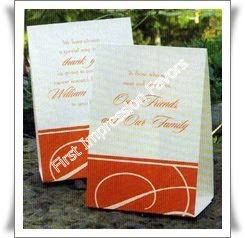 Stunning custom made to order favor bags that are one of a kind, created just for you. Perfect to fill with treats or gifts for your guests while creating a stunning display upon your reception, favor or candy buffet tables! Our textured linen favor bag is featured here in a rich chocolate brown with a double satin chocolate brown bow accented with a hand set pearl. A round personalized label featured in the LD Elegance font customizes this unique favor to perfection. Customize your own by selecting your color bag, color bow, choice of label, choice of font and even choice of pearl or rhinestone accent for the bow! Each bag arrives fully assembled ready for you to fill with candies, nuts, cookies, potpourri, bath salts or any goodies or trinkets for your guests! Also the perfect bag for a candy buffet as each has a tab tuck under the bow for guests to easily open and fill with scoops of candy. Bow measurements approximately 2 3/4"
For some wedding planning is not more than booking a banquet hall for the gala reception and ceremony. In actual wedding planning includes many more things. A perfect plan will include invitation ideas, bridesmaid dresses, attire for mother of the bride, not least selecting the right bridal flower bouquets. Most important is that you should make your wedding fun and fabulous. Every wedding has a budget. It depends that how much you want to spend on your marriage. Most brides and grooms feel overwhelmed in the process of wedding planning. Begin by creating a personalized month-by-month to-do list with an approximate wedding date. Add all meetings related to the wedding to your checklist so you don't forget. The reception party where all your guests come together to celebrate this event with you. It should reflect and complement the formality of your ceremony. The place for reception party should be selected depending on its availability, price, proximity to the ceremony site, and the number of people it can accommodate. Decision about food is also very important. The first decision that has to be made about your wedding food is whether you will hire a caterer or prepare and serve everything with the help of family and friends, of course. Basically, a caterer will be more expensive but less time-consuming on your part and, therefore, less stressful. On the other hand, buying and preparing the food yourself will save you quite a bit of money. Wedding planning should be done with fun and excitement. A wedding should always be a most memorable moment of life, so it should be done with care and excitement. A well planned wedding will give you an appreciation from others. However, if you don't do the proper research and stay within your budget things can go bad in a hurry. You need to make a well organized list of things to do. You need to keep the things well organized and simple. Here are some basic tips to organize a well planned wedding. The first that needs to be decided that how big and complex you want your wedding to be. You want a small wedding with some simple arrangements or would you rather have a big wedding? You need to make sure both you and your partner are on the same page and agree on things. Prepare to make some compromises. Decide a good and the most attractive theme for your wedding. This will include that how people will dress, kind of music, food, venue, and decorations. What is your budget for this wedding? How much can you really afford. There is no reason to go all out on a wedding if you can't afford it. This could lead to some really big problems with your families and you as a couple. Instead you can arrange a good and simple wedding within your budget by arranging all things in a well planned manner. Decide that you will make all the wedding arrangements by your self or you want to hire a wedding planner? Wedding planners are certainly great and do a good job. Be sure if you do hire one that they don't get you spending a lot more money then you originally planned. Make all the plans in time. Don't wait to long to get your plans in order. This is something that you must start taking care of. Decide about venue and do a booking for the hall on time, getting invitations ready, decide about foods and recipes and find your and your partner dress. Dress of bride and groom should be compatible to each other. Planning a wedding takes time and work. You need to set a date and get at it. If you don't you might find a year or two go by and your still not married. 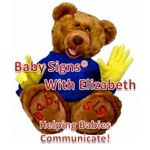 If you follow some of these basic tips and make all the arrangements accordingly I think you will find things to along smoothly. Soon you will be off on your honeymoon with your sweet heart. Make all the arrangements via a plan and enjoy your wedding party. As an article writer I love to write on different themes. Here I am providing information about wedding planners and wedding planning tips. If you don’t have a time to make all the arrangements of your wedding, you can go for hire a wedding planning company as well which best understand your needs and budget and make all the arrangements accordingly. 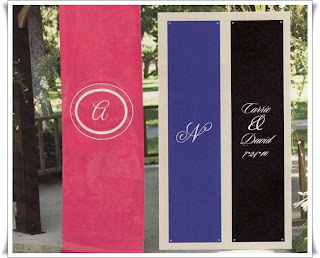 Our personalized hanging banners are a chic decorative accent for you special celebration! that calls for a little decoration and personalization. are sure to be impressed! Each vinyl banner measures an impressive 8 feet long by 26 Inches wide. Two sets of metal grommets on the top and bottom make for easy hanging. 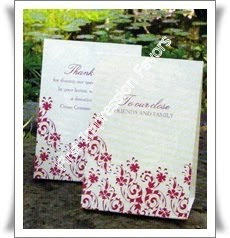 Available in your choice of a white printed letter surrounded by two decorative circles upon your choice of colored background. In lieu of traditional wedding favors, many couples are now choosing to say Thank You to their guests by making a donation to a favorite charity in their honor. First Impression Favors is proud to present our new line of personalized donation cards and tents for you and your guests on your most special day. To view our entire line please visit our Favor Donation Card Department. Our Personalized Donation Card and Jackets create a wonderful presentation to let your guests just how much you appreciate them sharing your special day and which charity you have made a donation to in their name. Each white donation card arrives in a brown jacket with your choice of personalization options. The Flourish design, an abstract floral print beautifully adorns the bottom of these donation tents in your choice of nine magnificent colors. Select a color to coordinate with your table decor! The Swirl design, an modern print, beautifully adorns the bottom of these donation tents in your choice of nine magnificent colors. Select a color to coordinate with your event theme or table decor! Our New Line Of Sand And Unity Candle Sets Will Help A Personalize Your Unity Ceremony. "The coasters we ordered from your co. are here and they look great! Many thanks to you & crew for the speedy delivery. Stacey is thrilled and says thanks as well. "The cupcakes came..... and they are BEYOND ADORABLE!!! Thank you... They are perfect for a little girls birthday party!! Totally! : ) I absolutely love them.... and my Nicole is just busting to break them open to see them all the way. Obviously she can't....... so that makes her even more anxious for her birthday party so that she can investigate them!! Thank you... thank you.... thank you... for offering such amazing party favors... because I believe the favors will really help to make my soon to be 8 year old daughters birthday wonderful and memorable!!! !